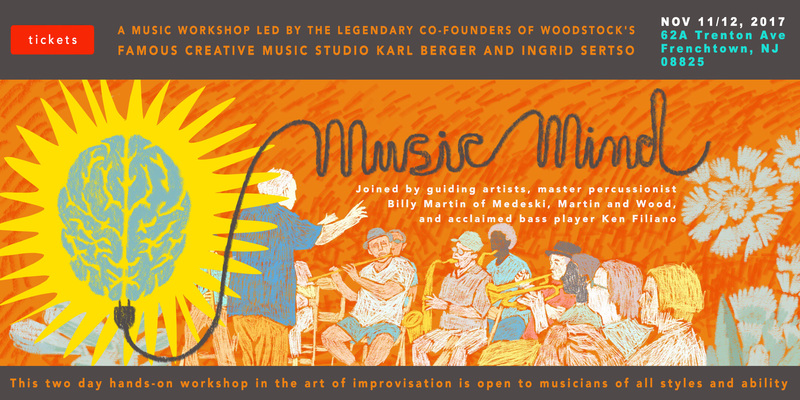 ArtYard is honored to host a special music workshop led by the legendary co-founders of Woodstock’s famous Creative Music Studio Karl Berger and Ingrid Sertso. Joined by guiding artists, master percussionist Billy Martin of Medeski, Martin and Wood, and acclaimed bass player Mark Helias, this is an opportunity not to be missed. Join us on Saturday, Nov 11th, and Sunday, Nov 12th, for this experience in our main gallery. “Music Mind” is a two-day hands-on workshop in the art of improvisation and it is open to musicians of all styles and ability who are 18 years old and older. Each of the 2 sessions will run from 9:30 AM to 6:00 PM. They include basic practice, rhythm and vocal training, and improvisation. Students will join the guiding artists in a performance on Saturday night at the ArtYard theater that will be open to the public. Price ($75) includes both days of the workshop. It does not include meals or lodging. Airbnb – Here is a link with some options in the Frenchtown area. The National Hotel. Within walking distance from the location of the workshop. Widow McCrea House. Bed and Breakfast. The Golden Pheasant Inn. Across the river on the PA side. Karl Berger conducting one of his workshops.